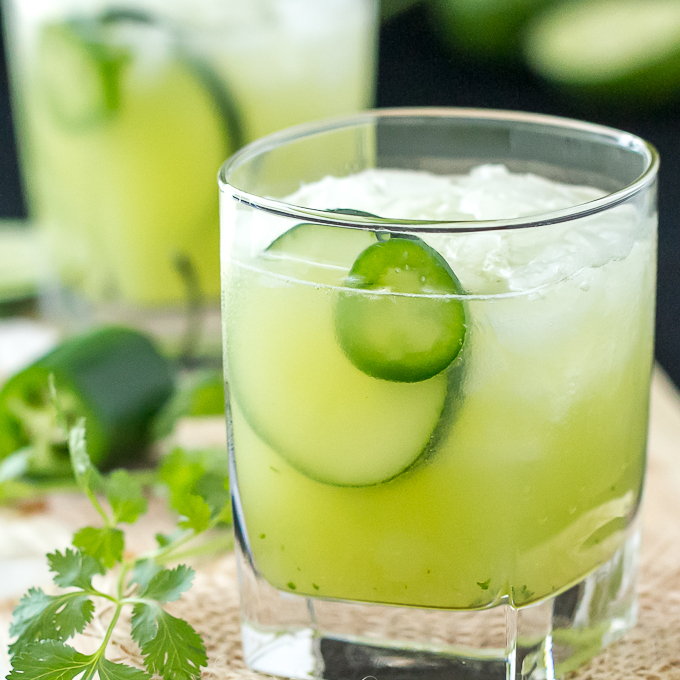 I’m on a cucumber juice in cocktails kick lately so naturally it was time to use it in a margarita with this version of a Cucumber Jalapeño Cilantro Margarita. I LOVE THIS MARGARITA! A couple weekends ago I made this margarita, snapped a picture of it with my phone (ok, yes a fairly ugly picture, I admit) and posted it on Instagram asking if anyone wanted me to share the recipe on here. The response was overwhelmingly…crickets. No one answered 🙁 Maybe I need more Instagram followers (hint, hint). I’m not to be discouraged easily so I’m taking it upon myself to share it anyways, because, frankly, it’s just too good not to! Peel a couple cucumbers and blend them well, then let them strain and toss out the pulp. That’s all you have to do for fresh cucumber juice! Don’t be hesitant to make fresh cucumber juice – you can always use it in a Cucumber Pineapple Mint Martini or a Cucumber Basil Martini too! 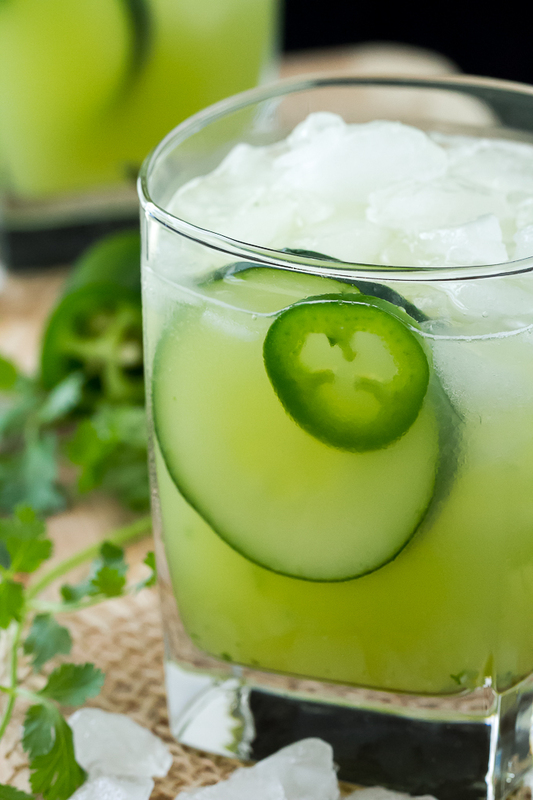 Once you have the juice, it’s just a matter of muddling a slice of jalapeño and a few cilantro sprigs together, then shaking up all the margarita ingredients together and pouring it over ice – I like crushed ice myself. I didn’t salt the rim but I suppose if you like that you could. Muddle cilantro and jalapeño in cocktail shaker with a little bit of crushed ice. Add tequila, cucumber juice, Cointreau, lime juice, agave syrup with ice and shake well. Garnish with cilantro, jalapeño or cucumber slice as desired. *To make cucumber juice, just peel a couple cucumbers and puree them in a blender or food processor. Then strain over wire mesh strainer and toss out the solids. Store whatever juice you don't use in the refrigerator, it will keep for several days. Whoa, jalapeno in a drink! Pass the fire extinguisher! 🙂 Just kidding! Sounds like it has a real nice kick. You’d need a fire extinguisher if you use a couple slices of jalapeño…trust me, I tried that first! I love the sound of this margarita…so refreshing with that little tease of heat! If I’d seen that instagram post, I would have answered YESSSSSSS! 😉 Pinned. My husband is loving Caesars right now, and I have tried a vegetarian version but still need to tweak it. However, I can totally have these magartias and I am going to! Cucumber and jalapeno?! Yes, please! Cucumber and jalapeño is such a good combination! Thanks for the follow! I’ll hop over and check out your Instagram too! I’ve had cucumber juice in a martini before, but never in a margarita, this sounds so delicious and refreshing, will have to try soon! Who hates cilantro?! This is the perfect summer cocktail Judy. I NEED to make this. We have got a lot of cucumbers in the garden and I love a margarita with a kick. Can’t wait to try it! 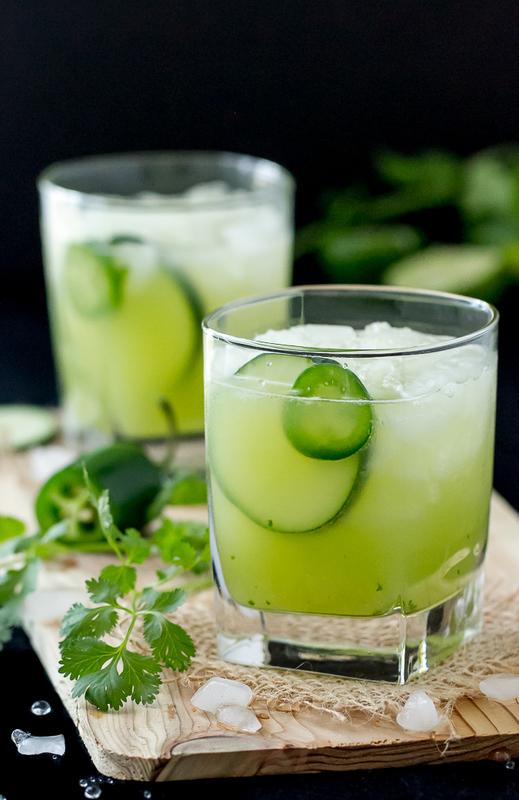 Well, if you like cucumbers and love a margarita with a kick than you’re gonna love this one!